Dr. Bonnie McVey joined the St. Norbert College faculty in 2000 after graduating from St. Norbert College in 1982 and earning a Ph.D. from Purdue University in 1992. A theoretician at heart, Dr. McVey enjoys introducing students to computer science as well as exploring advanced topics in theory and applications with upper level students. A favorite moment in Theory of Computation (CSCI 323) involves proving to students that regardless of how powerful computers become, there are numerous problems that the current model of computation can never solve. 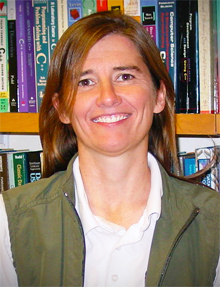 Dr. McVey’s research interests include identifying effective means, such as visualization and collaboration among faculty and students, for improving and enhancing the teaching of computer science. Additionally, she works to identify issues that dissuade students from pursuing computer science and to introduce changes that improve the likelihood of attracting students to computer science and keeping interested, qualified people involved in computer science.